Induction is the modern art of cooking. It is the best way to prevent the wastage of energy and heat. We have been bringing revolutionary changes in the kitchen. We are one of the most trusted Suppliers of Induction Stoves, Commercial Induction Stoves, Induction Cooker, Induction Buffet Warmer, Industrial Heavy Duty Induction Cooker, Industrial Heavy Duty Induction Stove, Buffet Induction Stove with remote, buffet inbuilt induction stove with touch screen, Induction wok model, many more. 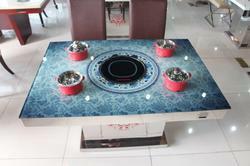 Our product is made with reliable material and equipment which gives it enough strength and durability. The range is widely used in food making industry due to its no wastage of heat, completely safe in use and cleanliness. All our Induction stove ranges will be available with a one year warranty. It is equipped with the latest technology motherboards and with copper coil to cater for commercial use. Get in touch with us for your requirement. We will give you more options to choose from. 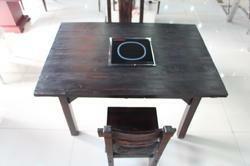 We have the following models of induction stove. 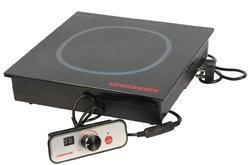 · Commercial table top induction stove – available in 3500W and 5000W. 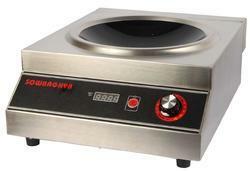 · Commercial wok induction stove – available in 3500W and 5000W. · Buffet warmers – available in 2500W and 3500W. touch screen or remote model. Call us to find out more details for your requirement. 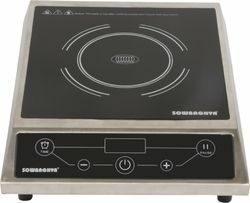 Buffet model induction stove with remote. 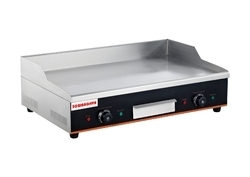 The in-built induction buffet warmers by Sowbaghya offer induction performance with greater electrical convenience and overall economy for simple hold-only applications. The units have enough power to maintain consistent buffet holding temperatures. The tempered glass tops on all in-built induction buffet warmer models are plain flat surface in order to be as unobtrusive as possible. The induction is made in a way, apart from the point of contact the other glass surface does not emit the heat. Low power design maintains consistent buffet temperatures. Round Shape Glass, so once you keep the chaffing dish, the glass is not visible. With remote, which allows you to install the remote at a distance of 1.5m from the unit. The remote has a self lock system to fit to your table. Power 3500W, Touch screen model, SS body, Crystal Glass, Temp Control, Unique Design. 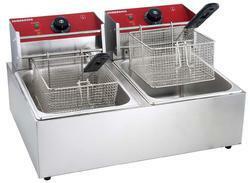 We supply Double Deep Fryers that are applicable for use in commercial settings. They come with double oil tanks and two baskets. These enable a quick, hassle free frying process. There is minimal spilling of oil which helps in keeping the surroundings clean. These can provide a large variety of deep fried food items within a short period of time. These have been economically priced. Looking for Commercial Induction Stove-Cooker-Cooktop ?